Acception is a Member and Tagholder of Nominet, the UK Domain Registry. We register .uk domains directly with them. We have lots of experience in sorting out domains that are "in trouble": suspended, uncontactable webmasters etc. We don't make a charge for this type of support, just our normal hosting fees. Domains registered through Nominet include .co.uk, .org.uk and .me.uk, plus for suitably qualified organisations .sch.uk, .ltd.uk, .plc.uk etc. UK registrations are subject to Nominet's terms and conditions. 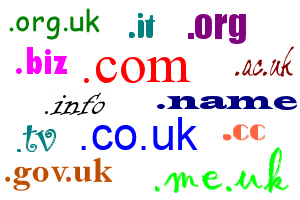 We can also register all the normal run of domain names: .com, .net, .org, .tv, .it, .name etc. Once you've registered your domain name, you need hosting to make it active on the Internet. Domain Hosting forms the basis of all our hosting packages. Your chosen domain name is parked on our servers and full email services are available - unlimited mailboxes, mail forwards and autoresponders. There's webmail too, plus, for computers on the move, an ESMTP server that will let you send your email from wherever on the Internet you happen to be connected. The web address for your domain can be pointed to any other website you want. If spam is a problem for you, then Spam Assassin is available as standard with all our hosting packages. With adjustable sensitivity, plus black and white lists that you can configure, annoying spam email should soon be a thing of the past. If you haven't taken one of our web hosting packages, the website for your domain can be pointed to web address you like.